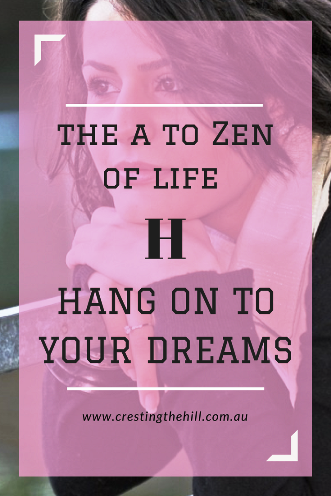 The next letter of my A to Zen of Life (via the Dalai Lama) is H for Hang on to your dreams. This one can mean a lot of different things to different people and I guess it comes down to asking the question - "What are your dreams?" If you don't know what you hold in your heart and aspire to achieve, then you have nothing to hang on to. I would have been the first one to say "Dreams are for Dreamers - and I'm too practical to have a pile of fanciful notions floating around in my head." But I think underneath all that I secretly envied those people who had grand notions of what they wanted to achieve with their lives. If you have nothing to aspire to then really, what's the point of living this life we've been given? It just becomes a daily grind with no destination at the end of the tunnel. I've decided that (for me anyway) dreams boil down more to being a bucket list of what I'd like to do. I have things I've already achieved, some that are in the near future, and some that are in the "one day" bucket for when I'm retired and have more time for them. I don't dream big dreams, but lately I've been thinking about what sort of life I'd like to have when I am older. Where I'd like to live when it's time to move from our house because we're too old to climb the stairs. I dream about the places near and far I'd like to travel to one day. I dream about how I'd like my job to be and what life will be like when I no longer need to work. I dream about how I'll spend my time now I have more of it to spare. Sometimes life gets in the way of our dreams, we have setbacks and things change - we wonder if there actually is light at the end of the tunnel. But, one of the big things Iife has taught me is that the saying "this too shall pass" is very accurate. The good times come and go - and so do the bad times, nothing stays the same but we constantly move forward. Even if life has thrown a detour at you, don't give up on those "one day" plans because things will turn around again and those dreams will become a reality. They may not look exactly how you first imagined them, but they are still viable and look pretty good when you finally achieve them. Do you have any dreams you're holding on to at the moment? Have you given up on something that maybe there's still time to achieve and celebrate? Dreams are what get us through those hum drum days of life - let's hold on tight to them because they are the light at the end of our day to day existence. I'm a big dreamer - I always have been. Over the years I've let go of a few...but replaced them with others. The astrology in me could say that I'm a Pisces so therefore I dream...hang on, I just said that, didn't I? Leanne I really do love this post as I've loved all of your A-Z posts. They have given me so much to think about. I do believe in Dreams. For me, I need my dreams. I need something to be coming up on the horizon. If I don't have that I tend to feel a bit groundless. At the moment, I'm dreaming of being able to walk the Camino de Santiago again in retirement. This is a huge dream for me. I agree it's good to remember your dream and to have a bucket list and acknowledge what you achieve. Thanks for this - thought provoking. i really like the thought of never giving up on the "one day" dreams even if life takes you on a detour. Dreams do make life worth living for. A timely post for me. We're often tempted to think that we can't achieve certain things now that we've reached midlife but that can be a disheartening thought and I'd much rather think it can still be done. 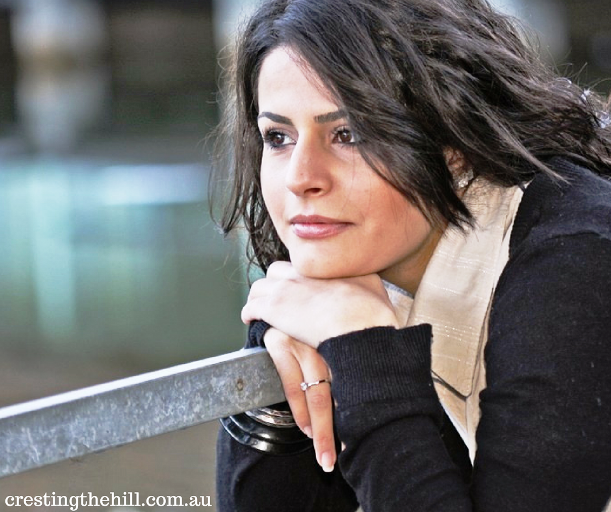 Just last night, I was telling my husband that long ago, my dream was to move back overseas. I grew up in Asia, and always wanted to go back. Somehow, this had never come up before. Now that we've crossed that first ocean, I honestly don't care if we never go back. I 'dream' constantly of things I intend to do in my life. Dream is in single quotes because I don't think of what I do as dreaming. I got irritated with an old boyfriend who would spin these elaborate dreams of the future because his dreams were substitutes for action. I'm much more interested in visions which I see as dreams with plans. 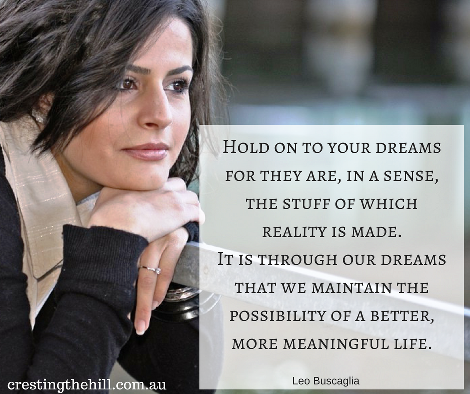 Do you consider dreams to be beyond goals? I like to look at life as the journey that we should make as enjoyable as possible versus hoping that once we have money, once we are retried, once this or that happens we may pursue our dreams. Meaning, do what is important to you NOW. You never know if there is a tomorrow or a "in 10 years". Of course you can't take a trip around the world every year, but if there is that one destination, if you really scramble together your vacation days and savings, you can make it happen!? I wouldn't consider myself a "dreamer" However, I do live each day to it's fullest as life happens and oftentimes those dreams don't come true. We are getting back to living our life to the fullest. A lot of things are like the old saying that if you wait until you have the money to have a baby you will never have one. I think that is the same for everything you will never have the time or the money so jump in and live. I am a great believer in the power of visualization to achieve your dreams. If I want something or to achieve something I work on imagining how it would feel to get it or imagine it and 'daydream' about it if you like. Some things come quickly, some take their time. I read a quote today (don't know the author) that said, "Goals are dreams with deadlines." So I guess a dream is a pre-goal. One of the most fun things I ever did was 40 things to do before I turned 40. It was so much fun, and included hiking by myself, something that always scared me but that I longed to do. I stuck to well travelled trails, and enjoyed the solitude more than I'd even imagined I would. This is a lovely post Leanne! My husband and I traveled a lot when we were both working full time because we couldn't wait for retirement and needed it from our mind numbing jobs. This leaves little on a bucket list and we do more, much more at home and enjoying life here. My dreams of the perfect ear of corn from the garden and sunflower harvest in the fall are more simple but for me just as rewarding as skiing the Alps! I dream, but I do not obsess. I visualize. There are dreams that live on in me such as places I would love to travel to and spend some time at. I love my dreams, they are a comfort, and a guide. I so love your A to Z(en) them and what you are doing with it. It is inspiring and motivating. So very true. Thanks so much for this today. Great post, Leanne! I always dreamed of being a writer. My parents pushed me in other more practical directions. Because I had no passion for them, I got nowhere. Now, 30 years later, I am living my dream. I may not be making a lot of money, but I feel passionate about what I am doing each day. I think it’s important to have dreams, or a future plan or list. But it needs to be fluid. It’s so fun to imagine big then tailor life as it moves forward! You and I have some similar dreams. I've been a dreamer all of my life. Some of the long time dreams I continue to hang on to while new dreams keep coming to me. I may be getting older, but I ain't dead yet! Huge dreamer here. Always dreamed of being a published author. When I achieved that goal, I had to come up with another, Now my big dream is to be a New York Times bestselling author. There. That'll keep me busy for a while . . . I firmly believe that you need a vision of where you want to go/be. It can start out as a dream, but then you must plan to make it a reality. Dreams without plans are mere fantasies. I'm not saying all my dreams come true. Some have changed as I've learned more about myself through life experiences. But I keep envisioning the future I want, and I keep (slowly) activating it! Dream big with a both feet firmly planted in reality. As you said, dreams change as we age. I like the idea of a bucket list, but when I latch on to something, I usually get right to making that dream a reality. Guess I'm not much of a dreamer. Beautiful post. I have similar dreams to yours. Less work, more relaxing. Good health.